Gustavus is a mid-strength moist tobaccos snus with an average of 8mg of nicotine per portion. The Gustavus snus brand is known for offering a snus that provides a generous length of time in the mouth, with the full flavour remaining throughout usage. 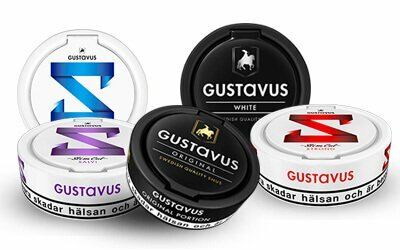 Gustavus, as with most snus brands, comes as Original or White. With a more natural tobacco taste there are hints of bergamot and juniper underlying the smoky taste of the tobacco leaf that creates a very satisfying blend. Flavours can last up to an hour with the taste evolving throughout usage, ranging from fresh flowers to citrus tones. The nicotine hit happens early on and the buzz can be felt almost instantly; a necessary and gratifying feature for all snus users. Of course, as with most snus brands, the many different flavours and sizes on offer are constantly being adapted, added to or improved upon. For those interested in tasting or experiencing Gustavus it is worth noting that whilst the flavour is there, it comes a little slower to the palette in the white snus version than the original because white snus is a drier form of snus than the original snus. White snus is preferable to those users who prefer a non-drip snus. Both offer a lighter and more airy scent to the tobacco when the can is opened, and as previously mentioned; have a bergamot tone with a sweetness and faint floral flavour in the background. This makes it one of the easier snus to keep in the mouth for longer periods of time. Gustavus is packaged in small round containers in either white or black. The design is comfortable to handle and easy to travel with. Gustavus users will appreciate the traditional feel and look of the product while enjoying the easy to handle smoothness of the can. Gustavus snus is strictly manufactured using traditional Swedish methods. It follows the conventional tastes and flavours that originally made Swedish snus so popular. Gustavus has seen a revitalisation in the past few years particularly between 2015 and 2016. Improving the brand has also seen its popularity increase further which is the reason a slim cut form has now been to be added to the brand. However, at this time it is only available in Europe. With constant improvements, Gustavus is a snus to try out for any snus user and with the traditional flavours on offer; this is a snus that will satisfy any snus aficionados. Gustavus snus is produced and manufactured by the large global company JTI or Japan Tobacco International; world leaders in tobacco products and the manufacturing of them. Now with its headquarters in Switzerland, JTI sells tobacco products in over one hundred and twenty countries. Continually growing, JTI had a staff of over 25,000 employees by 2011, with ninety offices and twenty-four cigarette factories, six research centres and finally five additional tobacco-processing factories. Formed in 1999 it has bought other smaller companies up over the years including a couple of Brazilian companies and one from Africa. With many well-known brands to its name such as Winston, Camel, and Benson and Hedges, JTI is a globally known brand. Whilst mainly concentrating on the cigarette side of the tobacco industry, JTI branched out into snus because the company has seen the growing popularity of this type of tobacco. With all this wealth of experience behind them, it means that Gustavus snus can be relied upon as a product of exceptional consistency that delivers the right amount of flavour and nicotine in a long lasting pouch. The ingredients used are only of highest grade quality.